Could Tories return to Blackpool? Blackpool could be closer to securing one of the prized political conferences. Conservative party chairman Brandon Lewis revealed his party is talking to council chiefs about the potential to bring the Tory gathering back to Blackpool. Currently a £25m new conference centre is being built at the council-owned Winter Gardens while planning permission is in place for a three-to-five storey hotel on an adjacent site. Mr Lewis said: "There is a conversation going on at the moment. We are talking about Blackpool." He said the Conservatives have two conferences a year, which are booked "for quite a long way in advance". The party chairman traditionally plays a significant role in the conference arrangements. This year's conference is in Birmingham, which is also hosting the party in 2020. Blackpool's new conference centre is due to be ready next year and will enable the Winter Gardens to hold up to 7,000 delegates. 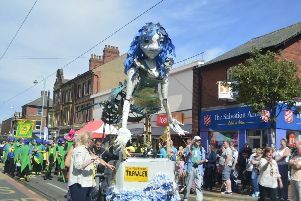 Kate Shane, head of the Merlin cluster of attractions in Blackpool including the Tower, said it would be a boost to secure one of the main political conferences. She said: "It is similar to the guys at the BBC bringing Strictly to Blackpool because anything like this gives us a huge lift." The proposed hotel is earmarked for a site between Leopold Grove, Adelaide Street and Alfred Street and would include an elevated walk-way connecting it to the conference centre. Mr Lewis was speaking during a visit to the constituency office of Blackpool North and Cleveleys MP Paul Maynard. A spokesman for Blackpool Council said: "Together with the Winter Gardens we have held discussions with a number of conference organisers about the potential to bring back some of the large-scale events that Blackpool used to host. "Initial discussions have taken place with various unions, associations and political parties including the Conservatives and while these are mostly at an early stage, we are confident that as the opening of the conference centre draws nearer, the Blackpool offer will become a significantly more compelling one."